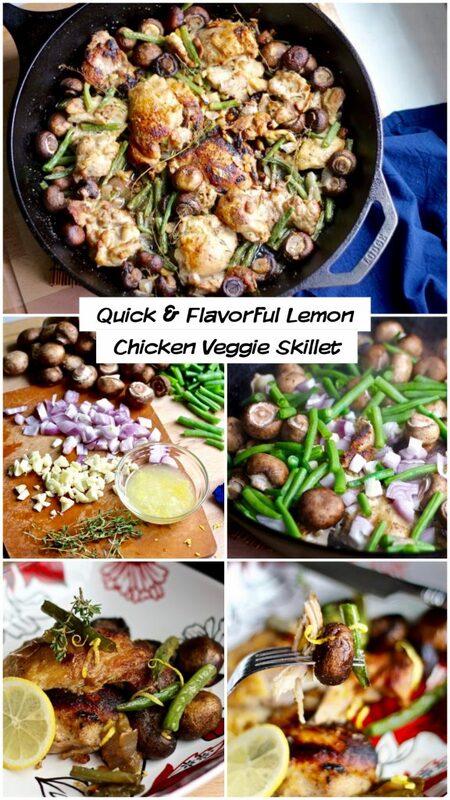 Ever since I bought my giant cast iron skillet I’ve been obsessed with one-pan dinners and this quick, flavorful lemon chicken veggie skillet is one of my favorites! 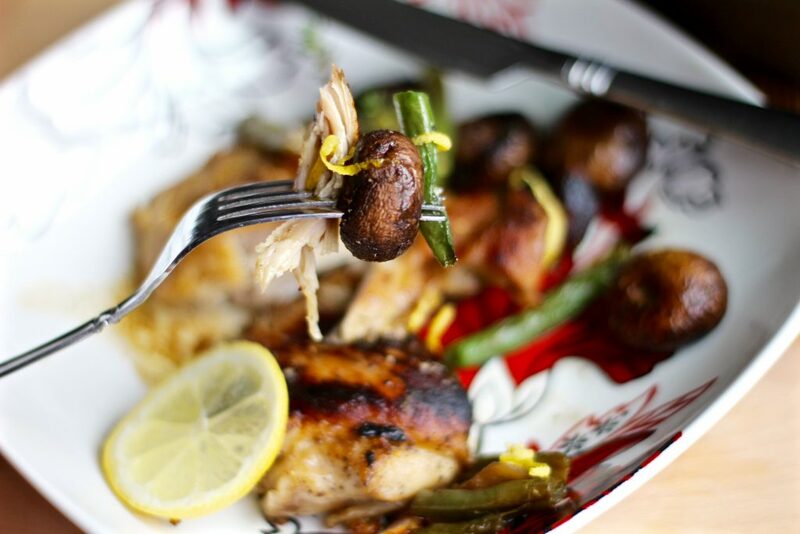 Sometimes when you hear the word “chicken” in a recipe you can’t help but think “boring and bland”, but this recipe is anything but that! 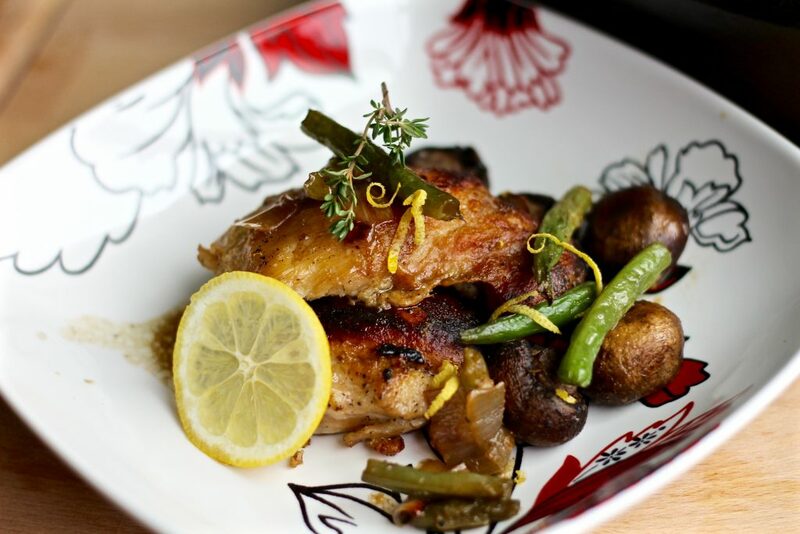 The boneless skinless chicken thighs are juicy and tender. Using high heat to sear the meat adds a layer of roasty flavor and ingredients like lemon zest, fresh thyme, garlic, and shallots come together to create a dish that’s packed with flavor. 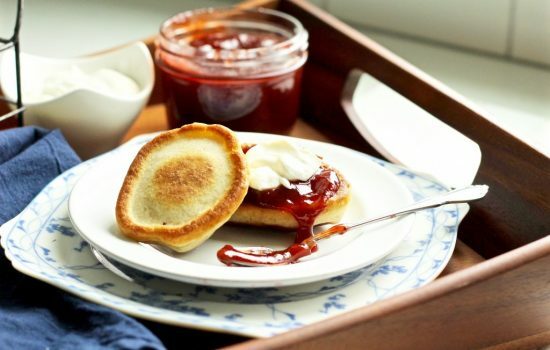 You don’t have to choose between quick and easy or flavorful here–you can have it all! 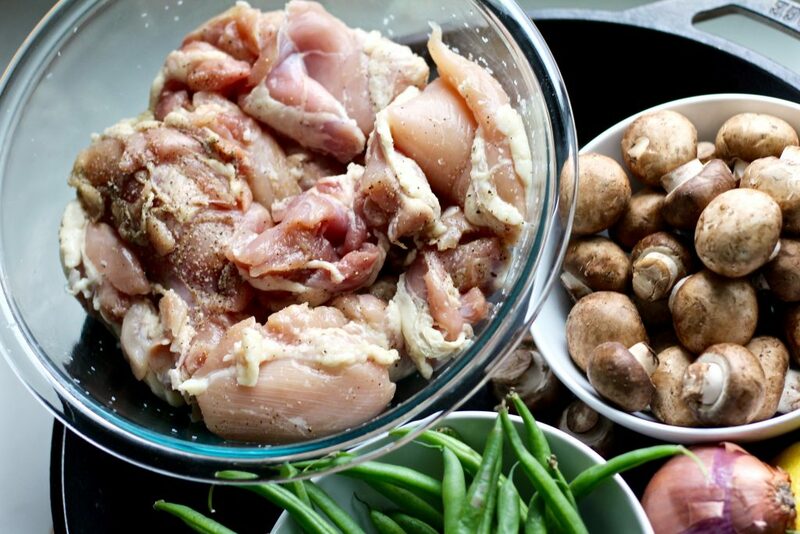 Pat dry chicken thighs with paper towels and season generously with salt and pepper. Trim ends and cut green beans to about 1″ pieces. Peel and roughly chop garlic cloves. 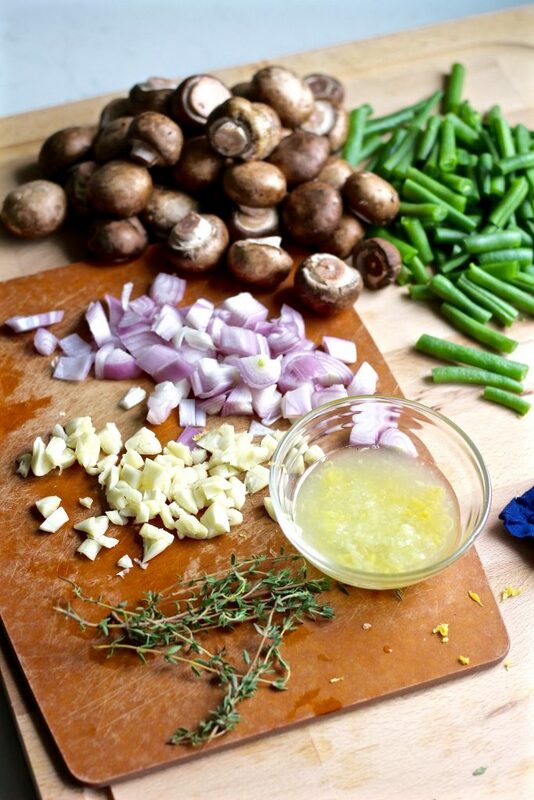 There is no substitute for freshly peeled garlic, it is worth the couple extra minutes of prep! To make the peeling easy, use the flat part of the blade on a large knife to press down and crush the garlic clove. It will help all the skin come away easily. Zest and juice the lemon. Adding the zest really vamps up the lemon flavor in this dish. 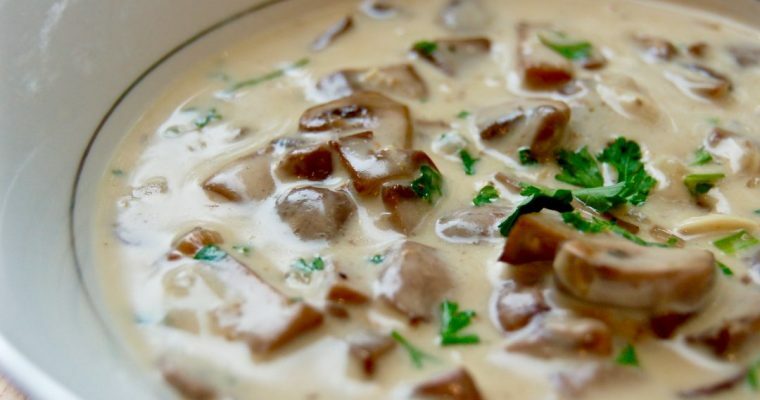 Rinse the mushrooms and trim the stems. 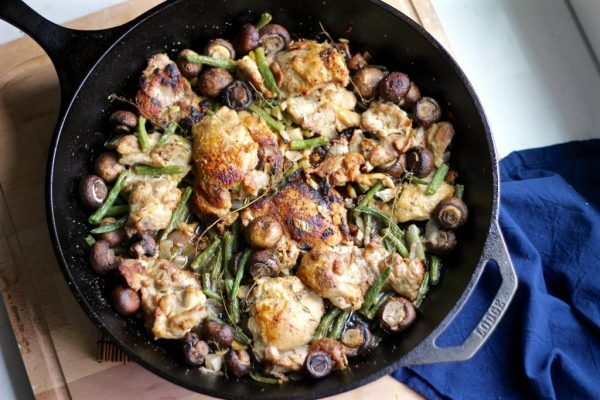 I like using the small button mushrooms for this lemon chicken veggie skillet because the texture of a whole mushroom is so unique and holds more flavor than sliced mushrooms. 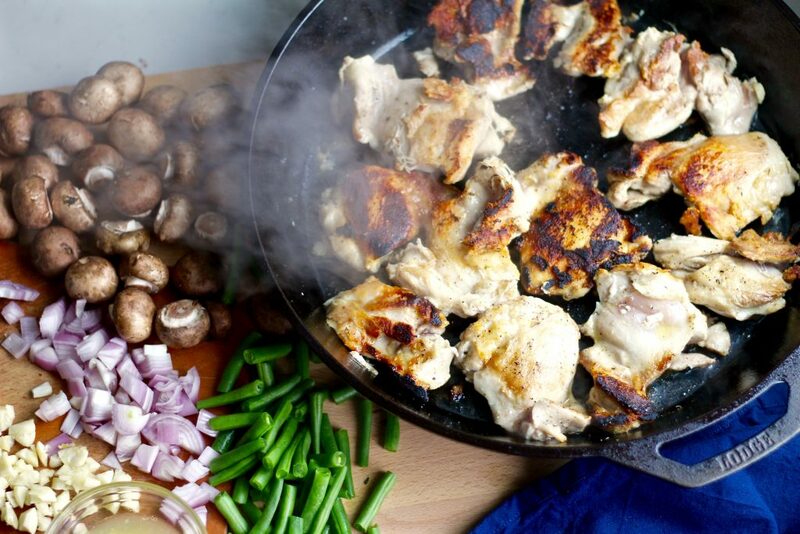 Once all your ingredients are prepared, preheat a large cast iron skillet (or heavy bottomed pan that can withstand the heat and is oven safe) on medium high heat for a few minutes. If you have an electric stove like me, it will take a good 3-5 minutes to get a cast iron skillet as hot as it needs to be, so be patient! You should hear a loud sizzle when the meat hits the pan, if not, wait a little longer. 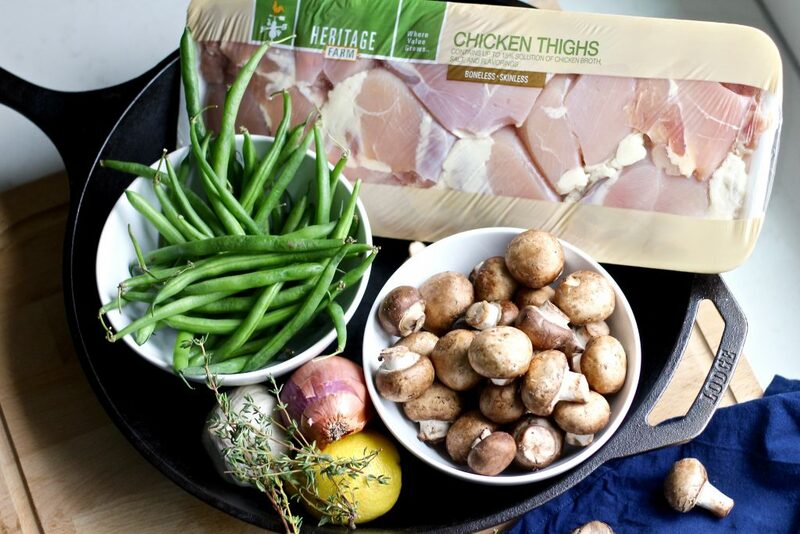 When the pan is hot, add seasoned boneless skinless chicken thighs. Sear on the first side for about 3-5 minutes. Don’t worry if it’s not evenly seared or cooked (mine wasn’t). 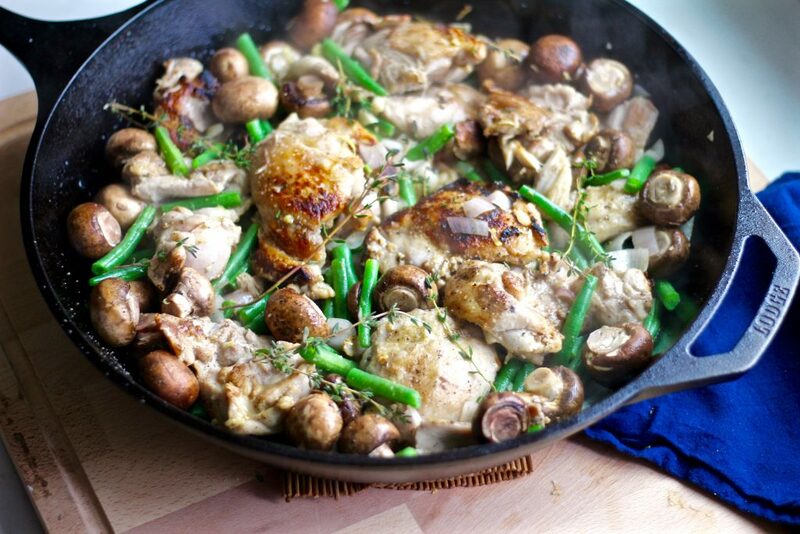 Turn chicken thighs over and add mushrooms, shallots, garlic, and green beans. Sprinkle with some more salt and pepper and cook for 2-3 minutes. Stir everything well and top with lemon juice, zest, and thyme. Toss once more. 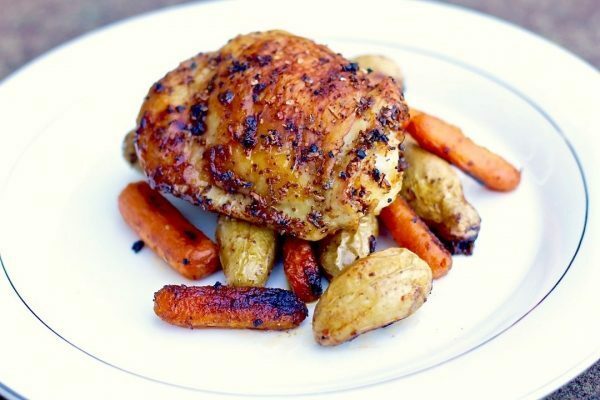 Transfer skillet to preheated oven and roast for an additional 20 minutes until chicken is thoroughly cooked and vegetables are tender. 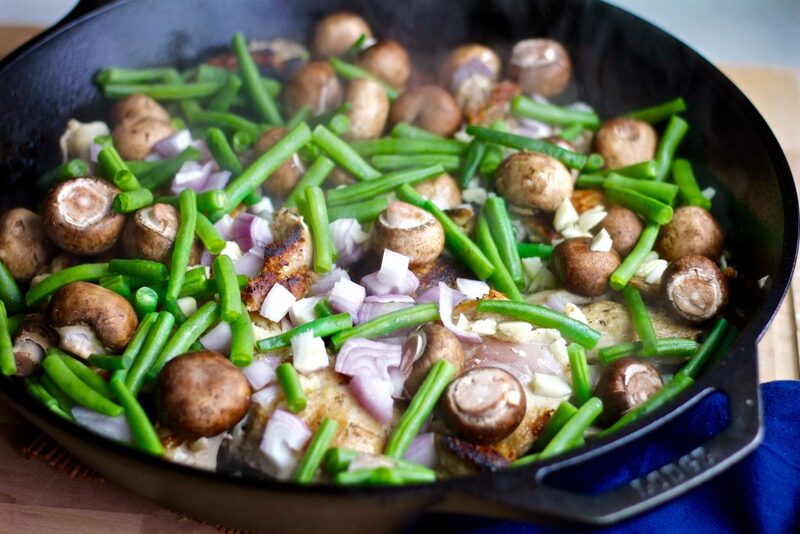 Serve this flavorful lemon chicken veggie skillet on it’s own if you’re looking for a simple low carb or paleo meal. 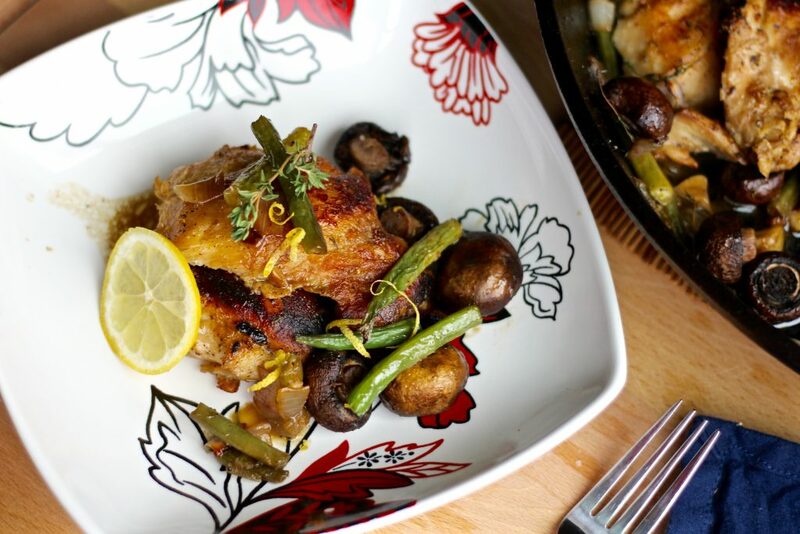 OR serve the chicken and veggies over some creamy garlic mashed potatoes for a delectable, restaurant-worthy meal!